Thanks mate! Good luck for the promotion race - you'll be filling up that massive stadium rapidly when you hit Serie A! The pre-season transfer wheelings and dealings went well - we signed 6 good quality players on free transfers and bolstered the squad with 6 loans. Striker Alessandro Rossi was perhaps the biggest name to join the club, but I was most excited about the re-signing of former Cesena youth product Luca Valzania who has the makings of a future club captain. Last season's loanee goalkeeper Guarnone joined us permanently from Milan. I had expected to struggle this season as the media predicted us to finish 15th and we were up against some strong opposition in Brescia, Verona, Chievo, Lecce, Perugia and Foggia, who beat us in the Serie C Super Cup last season. However, we punched well above our expected weight for the second season running and won the league at a canter. The season started with an extension of last season's unbeaten run as we went undefeated for 18 games before losing to Verona. 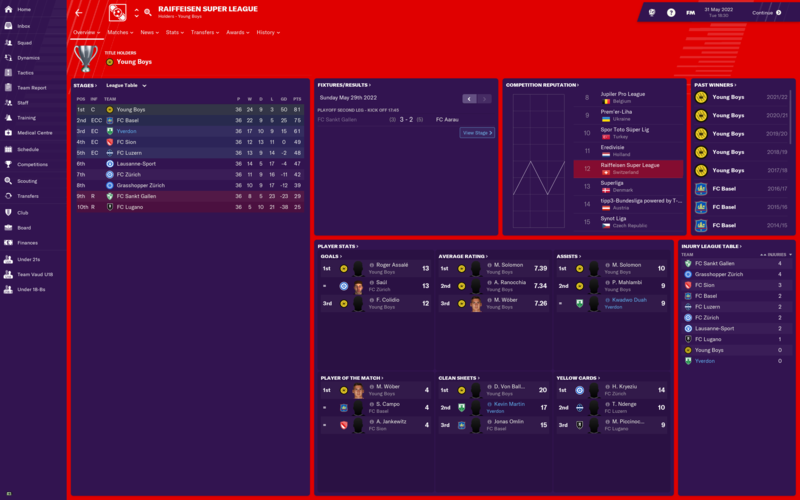 There were a few shaky moments, such as a 5-2 thrashing from Perugia and another defeat by Foggia - once again on the last day of the season - but we only lost those 3 league matches all season and finished a comfortable 17 points clear of Chievo in second. Game of the season was an epic 5-5 draw away to Chievo. Luca Valzania excelled in centre midfield and finished top scorer in the league with 19 goals, picking up Player of the Year in the process. Emanuele Rovini cemented himself as a fan favourite with another excellent season, and full backs Rondanini and Eguelfi both continued last season's good form. Rossi performed slightly better than last years' flop Erik Gerbi (who was sold to Crotone for a miraculous £600K!) but despite some experimentation I'm still not getting amazing performances from the lone striker. Rossi only scored 13 league goals, certainly less than hoped. Young centre backs Gabriele Bellodi, on loan from Milan, and free transfer Yves Dabila played well, forming a solid partnership at the heart of defence. Bellodi won Young Player of the Year, and I extended his loan for another year at the end of the season. Last season's standout left winger Bussaglia didn't feature as often this season, with his cover Marco Frediani's good form keeping him out of the side. Monty Banks won Serie B Manager of the Year, as well as Managers' Manager of the Year. So, next season sees the club return to Serie A with little expectation beyond a relegation struggle. 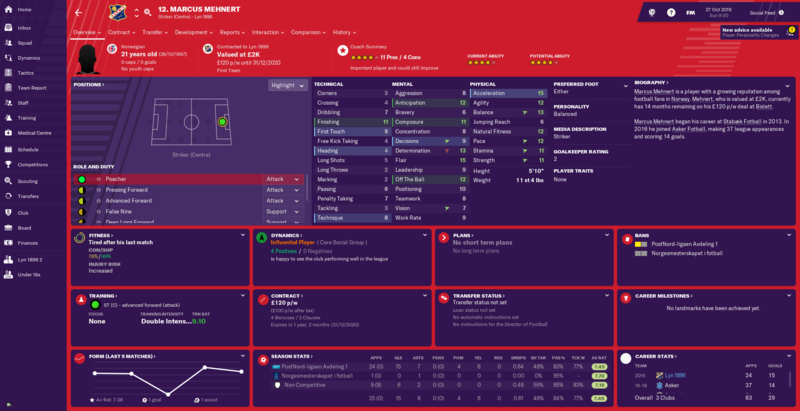 Monty moved swiftly to shore up the defence - in preparation for a tough battle against much sterner opposition - with the signing of French defender Matias Fischer from Nancy. Pescara right back Christian Ventola signed a pre-contract agreement and will provide cover and a rotation option for Rondanini. I'm looking forward to seeing how we get on against the big Italian clubs, and am cautiously optimistic based on the last two seasons of overachieving. Serie A will also attract larger crowds and a considerable wedge of TV money. 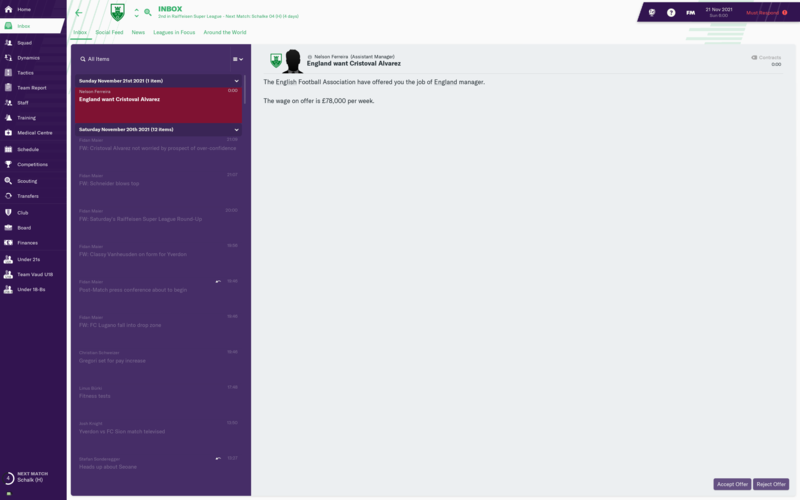 The club has been financially stable for the last two seasons, so I'm hoping we'll be able to rack up a fair bit of money in the top division! Well, Austria was a bit of a disaster that we will just pretend never happened. Time to try my luck in Edinburgh again. Last year we took the Civil Service Strollers to the Ladbrokes Championship, this year we'll try The Spartans. Not a lot to work with to start out but we'll build off some speedy strikers and a veteran midfield. Last time in Scotland we finished dead last our first three seasons, winning the relegation playoffs to stay up. So that's our low bar to beat to start out. Good luck @Tecmo, I do love a lower league rise to glory in Scotland. Look forward to seeing how you get on. Season finale and unfortunately, save finale as well After a pretty good run in the second part of the season, we managed to overtake Prato by quite some margin and finish in 19th place. But there is a catch about serie C that i was unaware of. Apparently, if you dont finish within 8 pts from the 16th place (which i didnt), the 19th place drops automatically as well. Of course, being a no serie D type of game, the relegation meant i got sacked even thou the board was very pleased with me. It was indeed quite demoralising, but that good run i had in the second half of the season gave me hopes, I'm pretty sure i would have survived the playouts if I had the chance to play them, so I've decided to restart the whole thing, hopefully learn a bit from past mistakes. sorry to hear that @Rolphynho. Hopefully the lessons you have learnt in this season help you for your net attempt. Pretty awesome to get to go on a trip to somewhere as awesome as that for work! 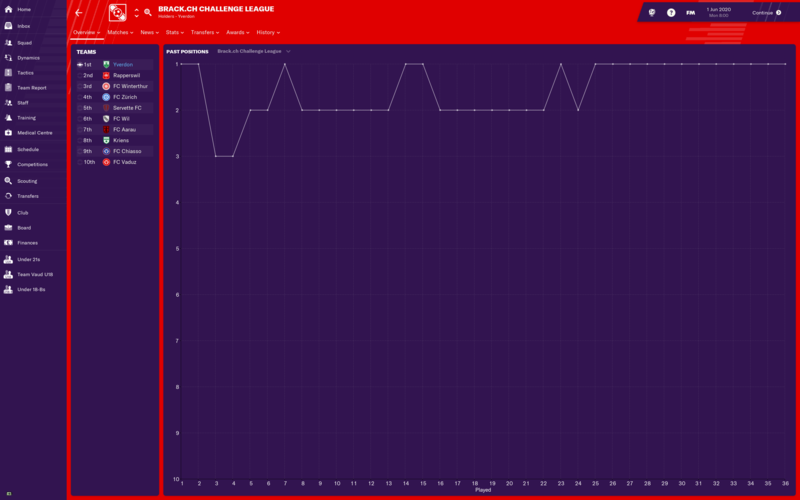 After last seasons promotion, my initial target was a mid-table finish for the new season. The media however thought we could do better and had us 7th. A steady start to the season where we found our feet lead into a decent unbeaten run (i forget how many games but it was around 10-12 i think) around Christmas where we established ourselves as a promotion contender. In the end the run between December and April we lost twice in 19 games as we hit top spot. By then we had established a decent lead which meant that a wobble in the final 7 games where we only won twice didn't damage our title win (just). 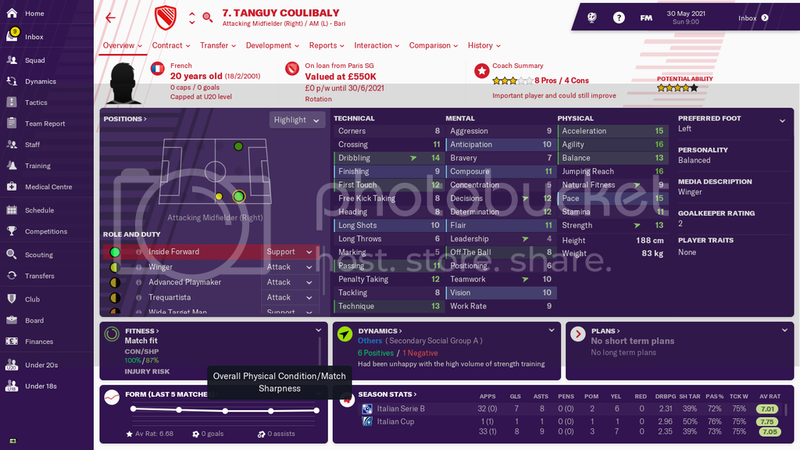 AMR: Tanguy Coulibaly - Young French winger signed on loan from PSG. Scored and created a number of important goals. AML: Sandro Freitas - Another young winger, this time on loan from Milan. The Portugese U21 scored 13 goals in the league, a key component in our success. 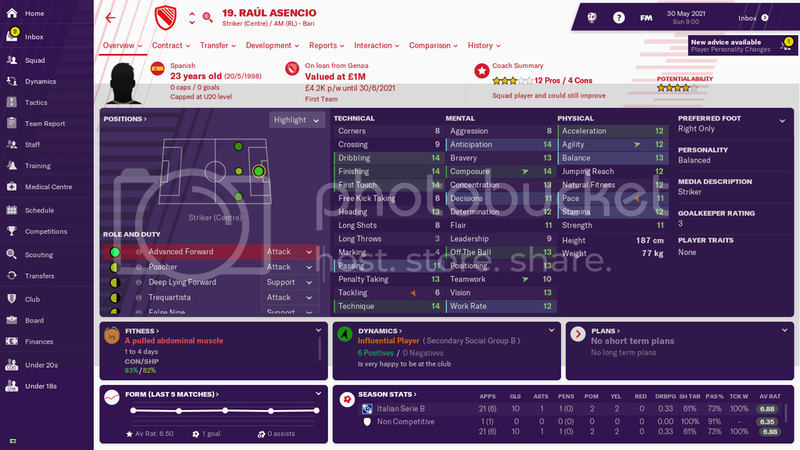 ST: Raul Asencio - Another loanee, again from Genoa, Raul was probably our best striker in a position we actually struggled in a little. Wow @rlipscombe that is a stunner of a season, promoted back to back as Champions is huge. I'm just about to look into the details, but looks like you had an awesome run. thanks mate. Took me by surprise to be honest but we had a great run during the winter and spring and we found ourselves in a good position. Hoping we haven't made it to Serie A too quickly though.. Here we are as I take over CD Lealtad Villaviciosa in Spain, the club is based in Villaviciosa, a city in the North of Spain, The club is nicknamed "The Leales" (Loyals), before 2014 they had been a regional only club, but since then they have spent 4/5 seasons in the 2nd Division B, I will be aiming to get them higher and hopefully succeed to become the first club from Asturias to ever win the Spanish League Title. The two highest ranked clubs in Asturias are Real Oviedo (Just promoted to La Liga in 2018/19) & Real Sporting de Gijón who are currently in the Segunda Division. Both of these teams have their B Team in our division. The first season here in Spain will be tough as when you take over on July 10th there is almost a full squad signed on the books already. Our Wage budget is €64,883, and we are already spending €58,873. That means we have to make do with a lot of loans and cheap signings, unless we can get rid of some of the guys costing us lots. I knew that would be your thoughts, but we're going there. First job to overtake our Senior Affiliate...S.Gijon. @rlipscombe - great work on the promotion! Quite a few similarities with my Serie B season there, such as struggling with strikers, the long unbeaten streak and ending up top of the pile. Well done! 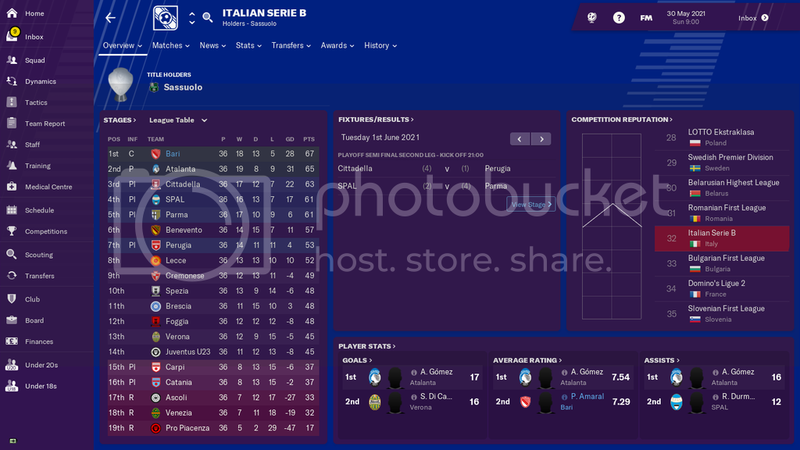 There's a damn good chance you'll do better than expected in Serie A - just finished up 6th in the first season among the big dogs (will post update later). Thanks @2481 would you believe I spent an hour on that save (After taking over) and then windows did updates and I lost that progress, have got back past that point again, but was frustrating. @2481 - 6th - i'll settle for that! Just couldn't seem to get the strikers firing.. The annoying part is missing out on the loan striker the second time around...going with a slow and steady improvement this time to try and avoid the issues with finances for later in the season. First note of Medori out, while he is good for this level, he could play striker, but as an attacking midfielder he wasn't needed for us right now, I got what I could and sent him off. Steven Prieto (ST) - Should be our starter, he came late so hasn't played in preseason, but I look forward to him playing a big part. Iñaki Olaortua (DC) - This guy is going to be in charge at the back, no question he will stop a lot of attacks and make a difference. Raúl Vallejo (MC) - Some great long range goals in the preseason, I can see Vallejo scoring some stunners in season, am looking forward to it. 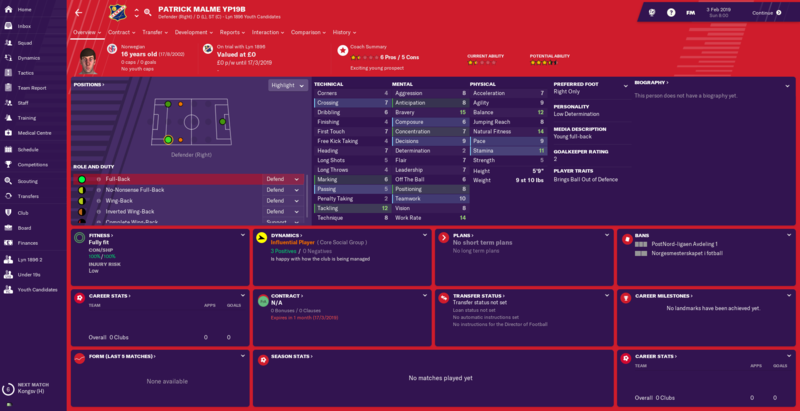 My Head of Youth Development has also made about 10 signings for the youth squad, which will be useful if injuries happen, and I am happy to let him continue doing this as they all look to be ok players who can cover for us. 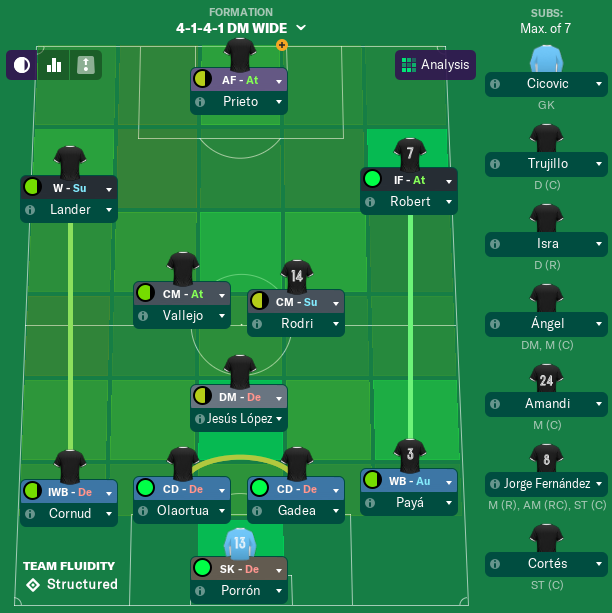 My standard starting line-up here, 6 of my 7 players signed are starting, Lopez is average, but I can't find a DM, Perron, Paya, Rodri & Robert are definitely good enough for this level, we should be able to avoid relegation with this squad. Well, my Spartans crashed and burned hard, board didn't even let me get to the relegation playoff. Had no luck finding players to bring in. We were actually pretty competitive, don't think we lost any league games by more than 3, 1 goal losses were pretty common. And scoring issues, my strikers were horrible. Eventually found a couple who could find the net but by then it was too late. Oh well, may take another look at Civil Service. In the meantime, playing around with my Austria save again. It's not quite as dead as I thought. Winless through 9 games but not last as we've managed some draws and still only 3 points out of safety. And we just got a massive 475K cash infusion for playing at least 9 Austrian players in 12 straight games? Very unexpected but the board loves it so if we can figure out a way to avoid relegation we would be sitting pretty. Oh, and I pissed off my best striker by pulling him after he missed a penalty. Despite a woeful start to the season - a streak of successive losses that left the club languishing in the lower reaches of the league - the lads produced some excellent mid-season form to fight their way up the table. With five games to go we were sitting only 7 points off 1st, with a whole host of clubs within reach of European qualification. Despite beating AC Milan 1-0 the team couldn't handle the pressure of the league closeout, losing the remaining four fixtures to finish a nevertheless respectable sixth. The team duly won the Serie A team of the year, and will enter next season's UEFA Cup at the Group Stage. Results great improved after several underperforming first choice players were dropped - young starlet Dennis Siciliano, new backup signing Jean Ruiz and goalkeeping stalwart Alessandro Guarnone stepped in as replacements for the much hyped but completely uninspiring Alessandro Rossi, Matias Fischer, and Maxence Prévot. All of my bigger signings seem to have struggled to fit the team so far, which is a bit weird. Luca Valzania became team captain and had a wonderful season, finishing as top scorer with 18 goals from central midfield. Unsurprisingly, Rovini had another great season on the right wing, Bussaglia performed extremely well on the left, and Rondanini was reliable as ever at right back. Belgian playmaker Siebe Schrijvers also put in a good shift over the season despite a slow start. Everything is looking very promising for next season - a top-six league finish to build on, a strong core of players who have been together for a few seasons now, money coming in from the UEFA Cup group stage, and a growing reputation with which to attract some higher calibre players to the team (though things didn't work out too well there with this season's flops). Serie A seems like a very open competition in this save iteration, with no single team really dominating things and about 10+ clubs all with a viable shot at the title. 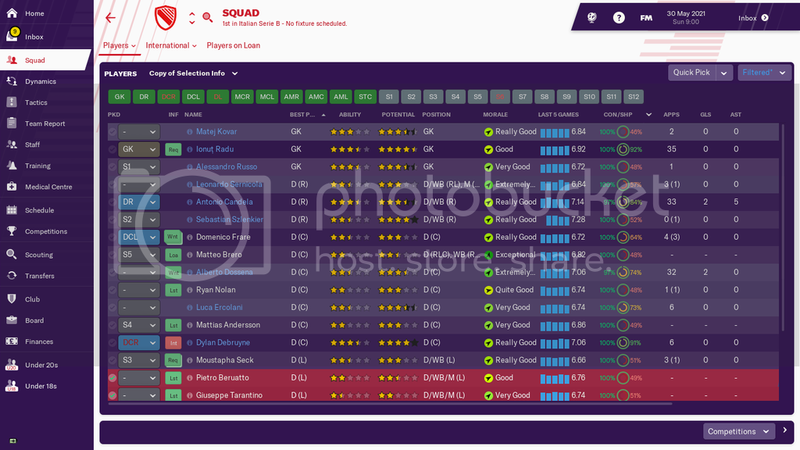 The striker situation is still irking me - young Siciliano was the only forward to finish with an average rating of over 7.0 and the midfield are still providing the most goals. Will have to persevere with that, although I think it's more a match engine thing than a major tactical issue. Unlucky @Tecmo, Scotland's brutal at that level. That's an interesting cash bonus in Austria, I didn't know about it. Do you get successive bonuses or is it a one-off thing? 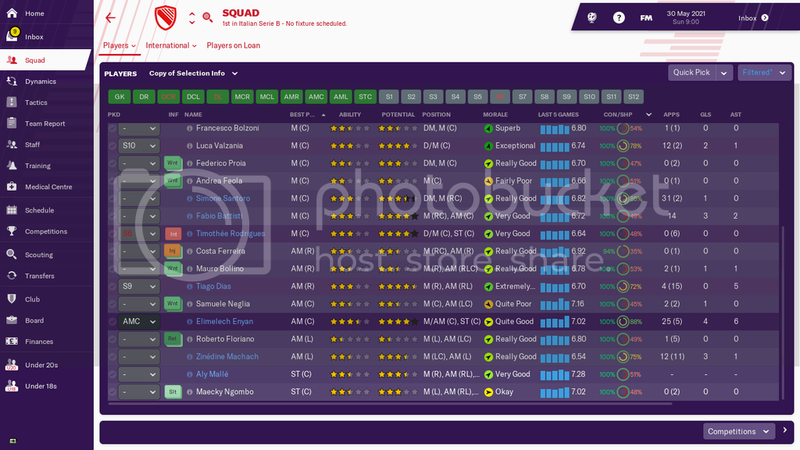 @Lower Leagues Rule nice update, good luck for the season! Don't know yet, was totally unexpected, just popped up in my mail from our president. Haven't been able to find any reference to it in league rules or anything. 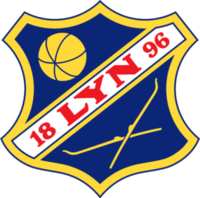 Yep, Norway again and back with Lyn Oslo with whom I had a great career in the FM18 challenge. Hopefully a good fun repeat in FM19. Nice one @Crispypaul, good luck with Lyn. I had a great save with them back around 2005 or so. 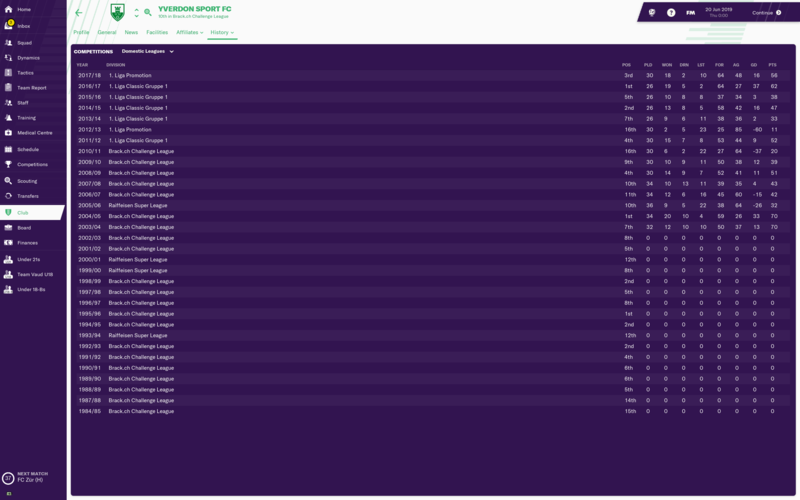 Hey all - decided to make this year's attempt at this challenge my first main FM2019 save! I couldn't quite decide whether to go with a small league or a big league so I decided to split the difference and went with a medium league - Switzerland! 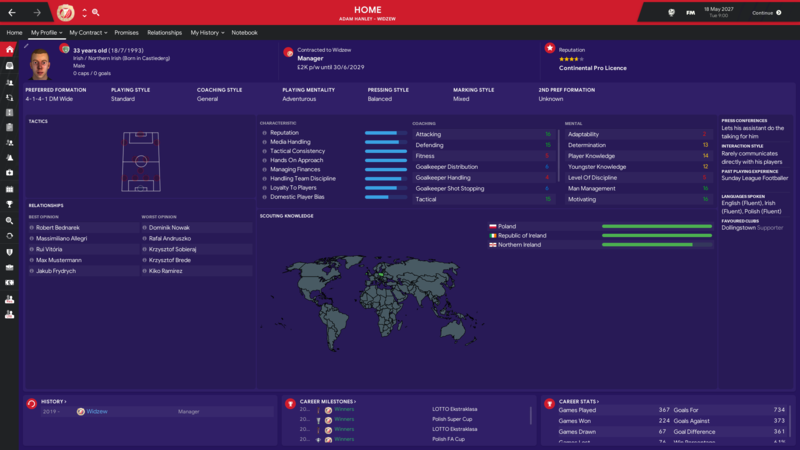 Despite having played since the original Championship Manager I've never had a serious game in the Swiss league so I'm excited to see where this one takes me. I'll be managing newly promoted Yverdon Sport FC, a team that actually has a decent amount of history - they won the Swiss Challenge League (2nd tier of Swiss football behind the Super League) as recently as 2005, which means they were in the Swiss top flight back in the 2005/06 season (but were relegated right away). 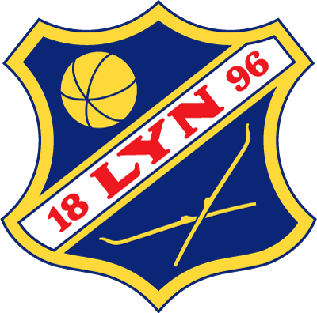 They were also runner up in the Swiss Cup back in 2001. 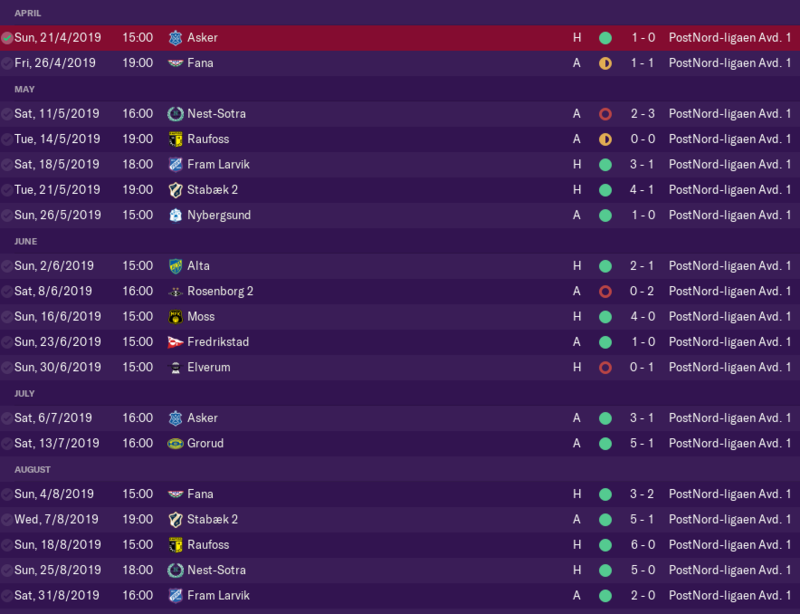 Since then they've clearly fallen on hard times, dropping down into the Swiss third tier in the 2010/11 season, but having spent eight years in the wilderness, they've been promoted back into the Challenge League and it's time to see where we can take them. This season we clinched the league title with 5 still to play, and that makes 3 in a row, so from here on the focus will be shifting. As has been my transfer policy to this point, the majority of these were youngsters coming in with an eye to them being good players for us in a couple of years. Having both Hugo and de Vries both in and out in the same season felt a little odd, but neither were playing regularly and Hugo was non-EU. Both went out with sell on clauses, so I'm happy enough with them. Prochazka and Valencia both came in as fully-fledged Wonderkids and Valencia especially has been representing incredible value for money. 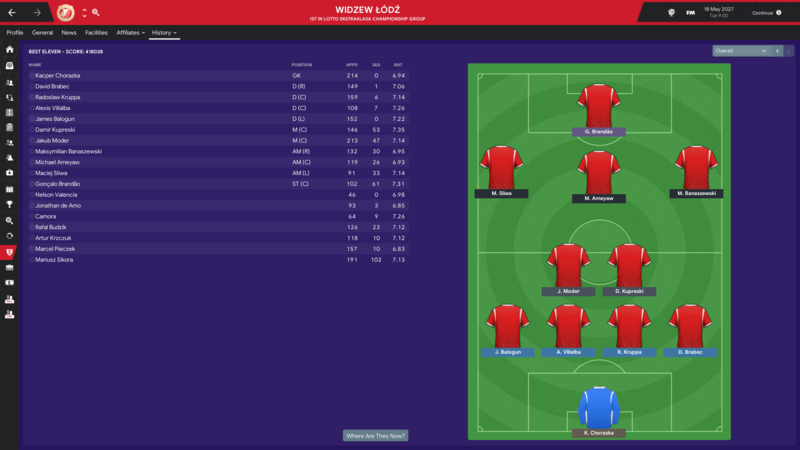 One thing I did notice toward the end of the season, though, was that my best XI only has a single Polish player in it. 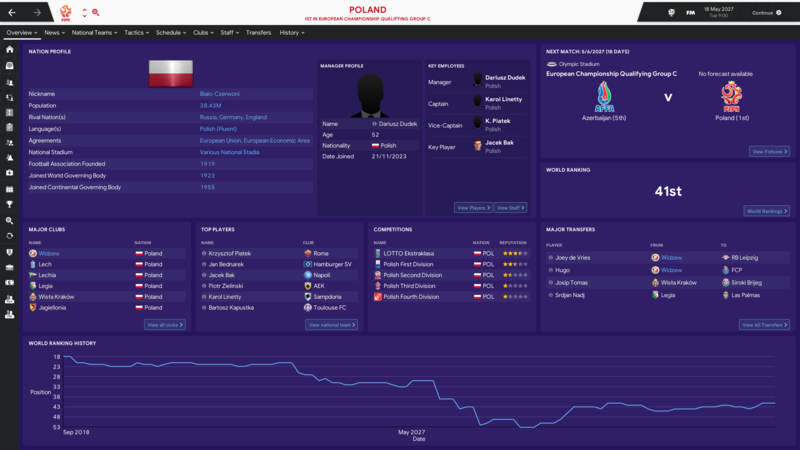 As the board are giving me silly transfer budgets for a league of our stature, I'm going to look to invest in some more Polish youngsters even if it means overpaying a little for them. For this season we got entered straight into the Group Stage of the Champions League, but unfortunately we are still a 4th seed giving us a group of Arsenal, Atletico and Leverkusen. We were actually quite competitive - beating Leverkusen both ways and then we won the home tie against Atletico to set us up with a chance of going through on the final matchday home to Arsenal. A win would keep us level on points with Atleti, with both results having been 3-1 to the home team meaning it would come to goal difference. Unfortunately, it wasn't to be as Arsenal squeezed out a narrow 1-0 win against us to force us down into the Europa League. 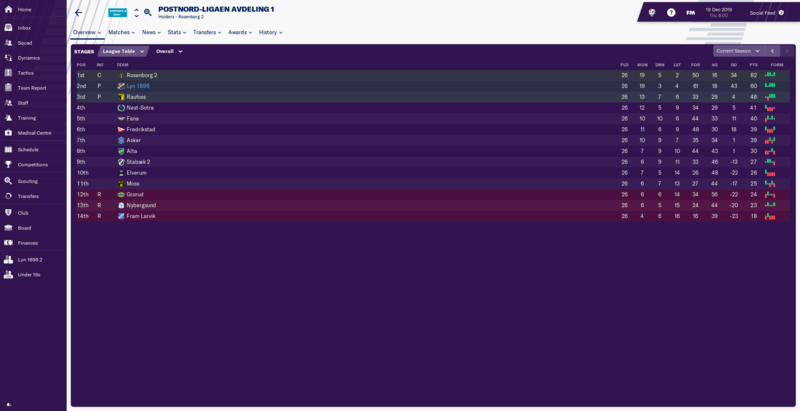 Once the knockout stages started we were given the relatively simple progression of Slavia, Hamburg and AZ to bring us to a Semi-Final against Real. Unfortunately, this was to be where it ended, but it was a step further than the season before so I can't really complain. 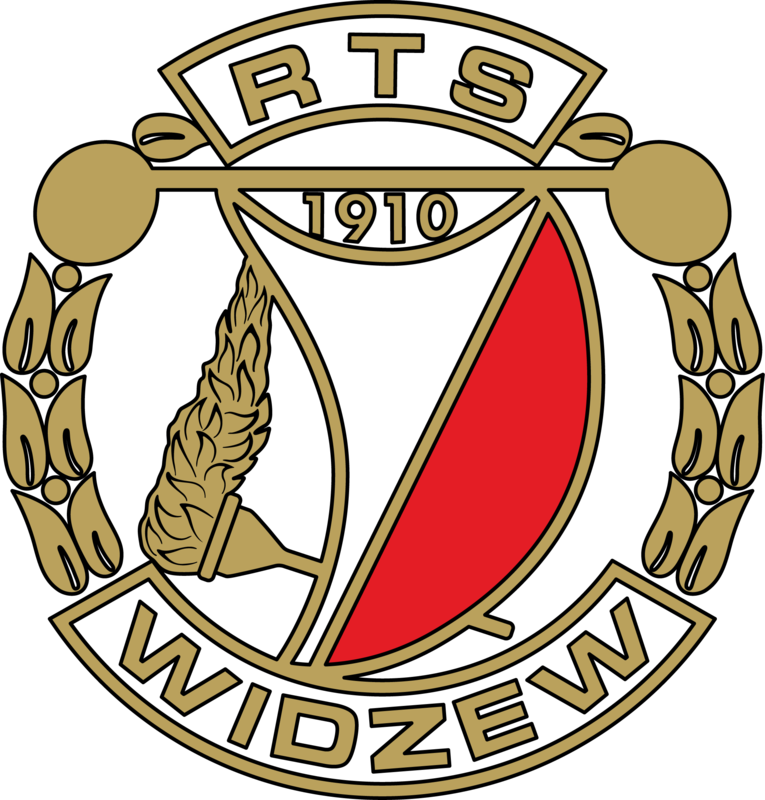 The Polish coefficient has dropped again, meaning this coming season we will have to go through the playoff again, but I'm confident we can make the Group Stage again. We are now on the final march toward the end of this challenge. This season did also see me take up a position as a club legend - the first for the club. Maybe in the not too distant future we might look to build a new stadium. I've not ever had one named after me in all of my FM years. Damir Kupreski (MC) - Another great season for Kupreski saw him provide another 10 goals and 13 assists with a 7.35 average rating. Not quite as spectacular as last season, but still invaluable. 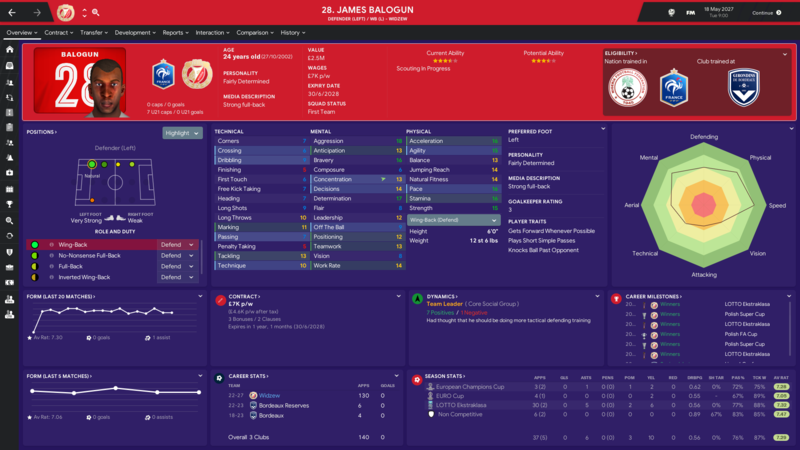 James Balogun (DL) - Whilst the French left wing-back didn't light up the stats charts, his work on the wing allowed Kubicek ahead of him the freedom to really involve himself in the play all the time. Solid defensively as well meant he is in no danger of being dropped any time soon. 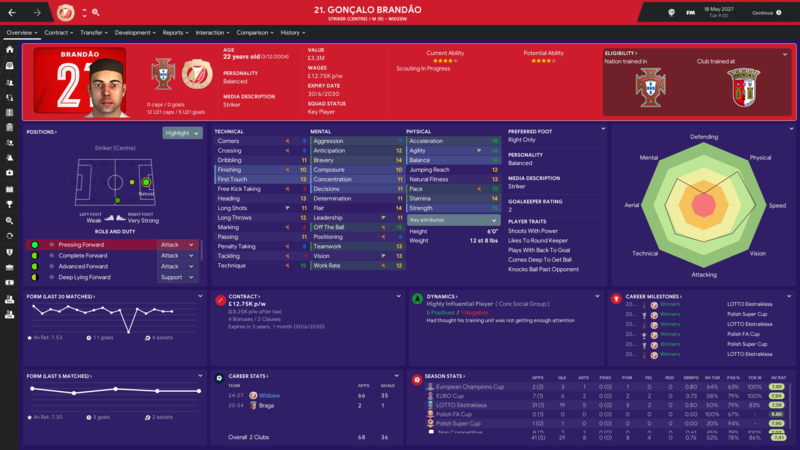 Gonçalo Brandão (ST) - Last season I stated that he was unfortunate to have remained my second choice. This season he repaid my promoting him be providing 29 goals. It's not a world-beating total, but with double figures across multiple other players on the pitch, it's exactly what is needed. What was expected to be a battle for survival quickly became a race to the top as we came out of the gates all guns blazing and didn't ever really stop, never falling below 3rd place. For a long time it was a very tight race between ourselves and eventual runners up Rapperswil, with the two teams swapping back and forth between 1st and 2nd for two thirds of the season. However, after we beat them 3-1 in the first game back from the mid-season winter break, we finally began to pull narrowly ahead. 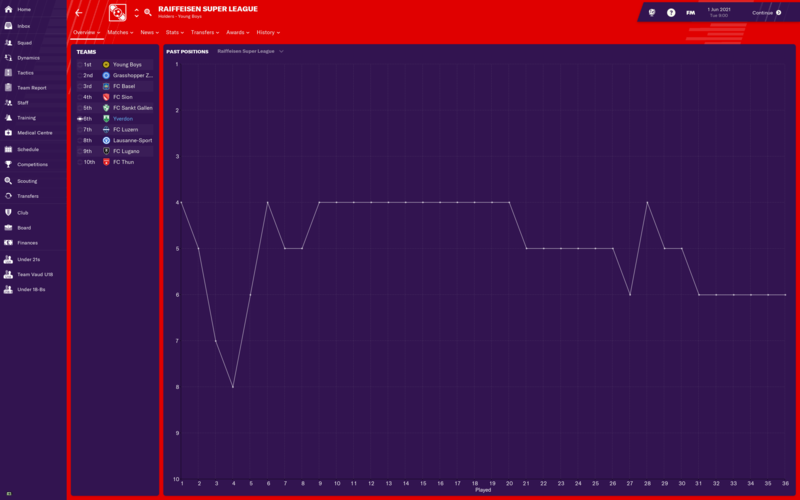 With four games to go, we were still just separated by 3 points, but they failed to win any of those last four games, which meant a return of two wins and one draw were enough to deliver the title and the one automatic promotion spot to us by a more comfortable than it seemed five points. Entering the competition at the 1st Round stage, we comfortably took care of lower division side Thalwil in a 3-1 away victory, fulfilling our season expectation of reaching the 2nd Round in the process. 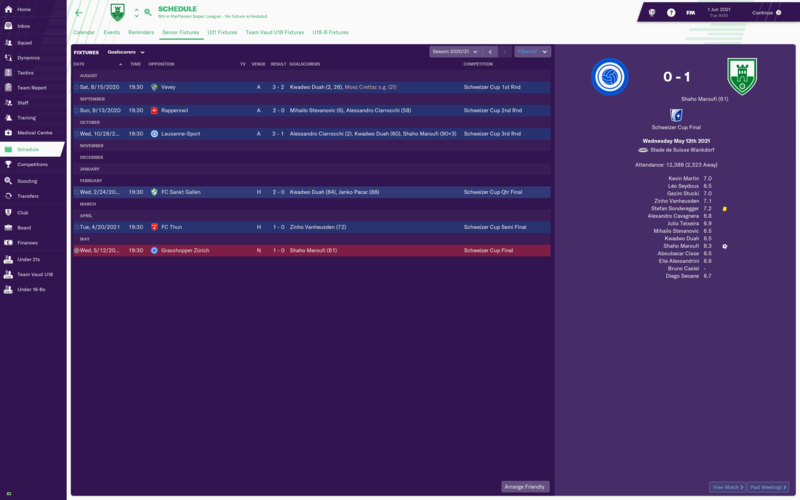 We were drawn against our eventual promotion rivals Rapperswil in the 2nd Round, and managed to progress with a 3-2 win after extra time at home. For the 3rd Round, we were drawn at home against FC Basel, one of the giants of the Swiss league, and while the 3-1 defeat was not unexpected, the payday from the home crowd, our second biggest of the season, was welcome. 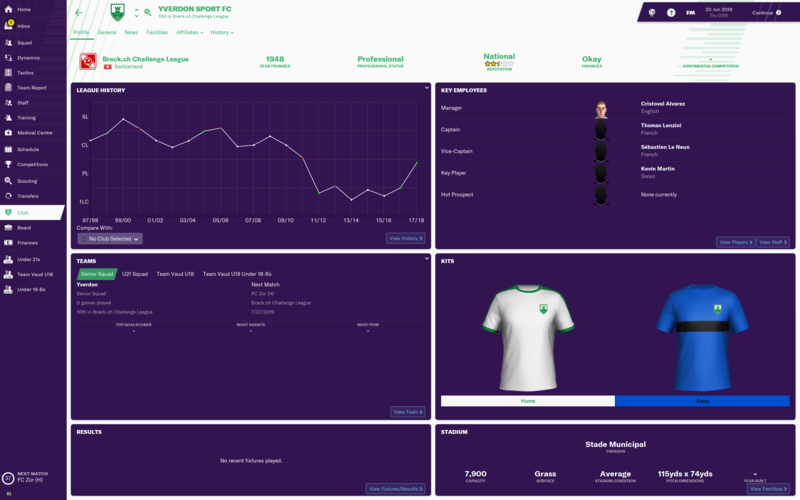 The squad was in relatively decent shape when I took over, so to meet our pre-season expectations of avoiding relegation, we were only looking to make an upgrade rather than a full overhaul. 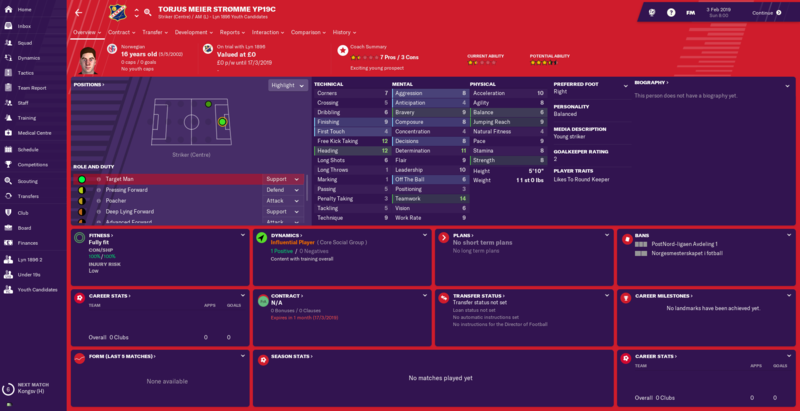 We brought in Austrian left back Stefan Sonderegger, at that point playing for a lower league Swiss team, and Portuguese midfielder Julio Teixeira, a veteran of the Swiss league who had been released on a free transfer from our Challenge League rivals Rapperswil. We also brought in some loan players from some of the bigger Swiss teams, with midfielder Nikola Milosavljevic coming in from FC Sion and impressive Austrian forward Aboubacar Cisse joining on a season loan from FC Basel. 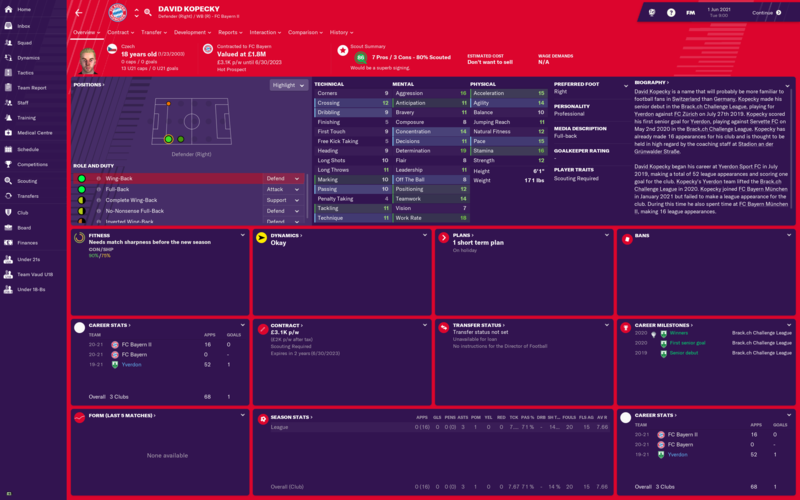 Find of the season though was Czech U-21 right back David Kopecky, who came in on a free transfer and exceeded all expectations by establishing himself as a first team regular at just 16 years old. 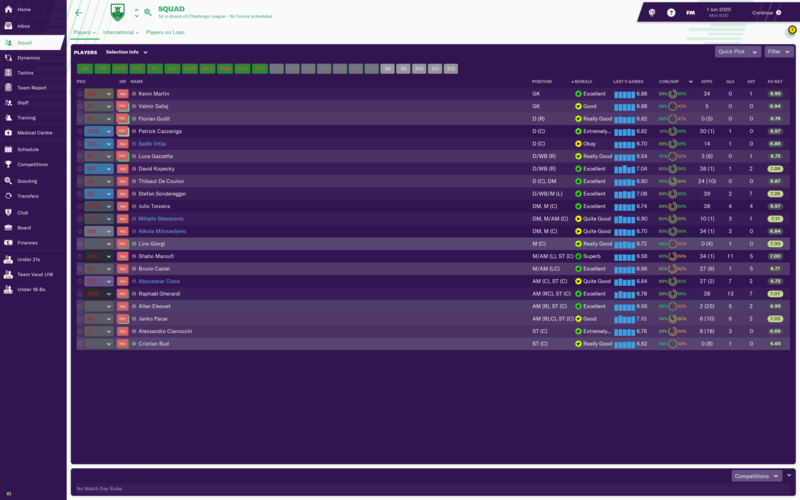 During the winter transfer window a couple of the old guard who were disappointed with lack of playing time departed, and we brought in three more loan players to strengthen our promotion chances during the run in. 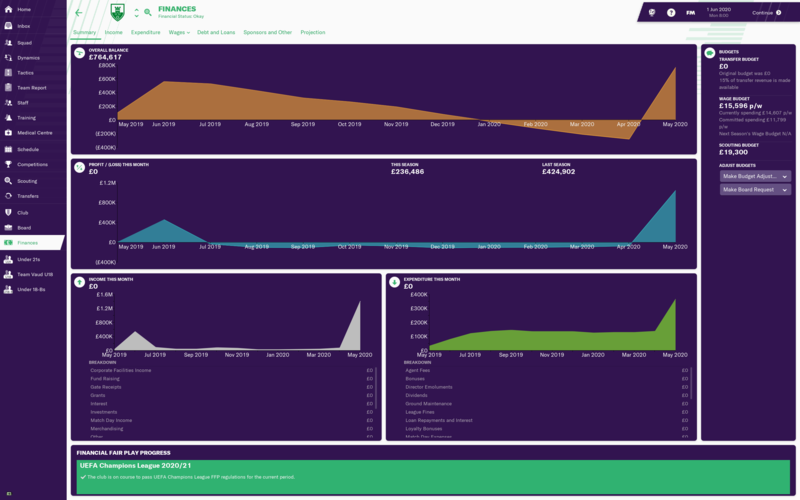 The season started with a nice surprise of nearly £500k in sponsorship money going into the club account - not enough to make any big moves in the transfer market, but enough to keep our head above water I hoped. 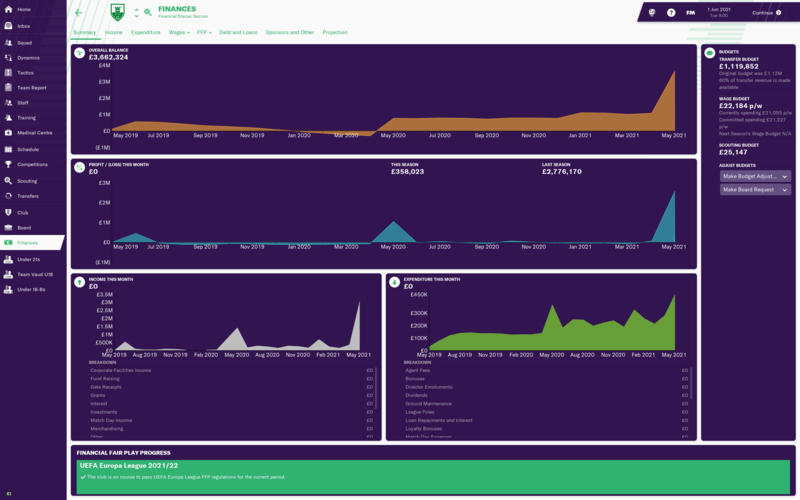 However, we operated at a loss of close to £100k per month despite me sticking rigidly to the wage budget, meaning that by the spring we were nearly £300k in debt. Fortunately the board injected £190k in May to keep the club running, and the £630k we won in prize money at the end of the season is enough to put us on a pretty even keel for next season. With the £500k of sponsorship now in our coffers for next season, we currently have £764k in the bank. I'm not sure what TV money or other revenue we might have coming our way for being in the Super League next season, so I'm hoping we might even get a bit more before the season starts to really establish us financially. Obviously survival and consolidation is our first priority. While the players who were at the club when I arrived were good enough for our promotion charge this season, there's no way they're good enough for the top flight. On top of that most of them have contracts that are expiring in the summer, and will not be renewing. That frees up a chunk of wage budget for next season, but our budget only increased from £13k p/w last season to £15k p/w this season despite our promotion, so it's going to be a bit of a struggle to put together a squad good enough to stay up with that money. We relied fairly heavily on loan players last season and we may find ourselves doing the same this season if we want to stay in the Super League. Got a weird error and not only did my report post before I was ready, it double posted too! Whoops! A stronger, more cohesive squad and some good consistency in the league led to us clinching the title on the last day of the season. It was a properly nervy finish, with five out of the top six teams in contention with two games left to play. 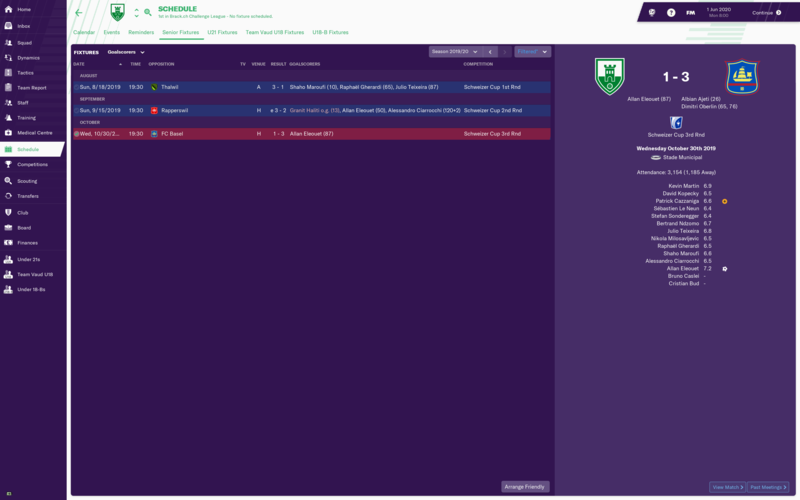 Things were not looking good following a 2-2 draw with Udinese at home, but a 3-1 win over Sassuolo was enough to win the league by two points after other results went our way. Not a very convincing way to win our first ever Serie A title, but they all count! The team also performed admirably in the UEFA Cup, comfortably finishing top of our group and making it to the 2nd knockout round where we were cruelly dispatched by Monaco on penalties. 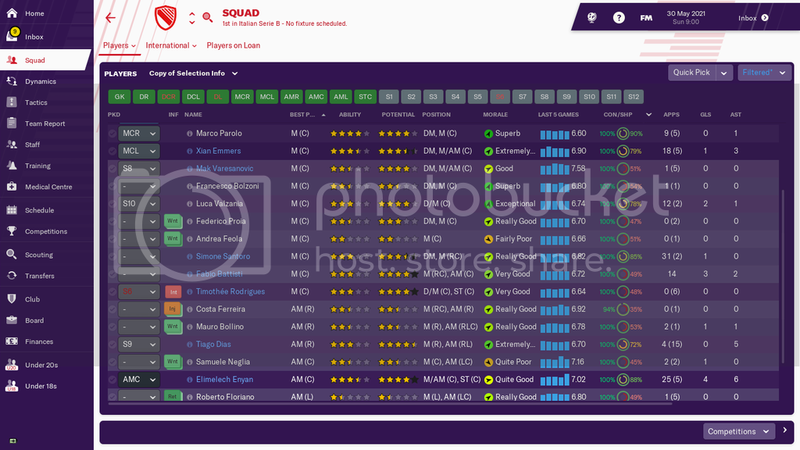 Transfer-wise Monty Banks recruited some quality players, the most talented of which, Giorgi Arabidze, joined on a free transfer. Young Argentinian wonderkid Alan Costilla signed for £4million and had a great debut season - he's definitely one to watch - and Peruvian starlet Diego Saca also performed very well in the number 10 role. Rovini had yet another solid season, rotating in both the AMC and MR positions, and captain Valzania was again the player of the season and has cemented himself as one of the best central midfielders in Italy (still no international call up though). Belgian left-back Senna Miangue, another new signing, had a great season, as did centre-back Jean Ruiz. Bring on the Champions League! @2481 - wow, champions already! That's some impressive work. How do you think you'll fare in the Champions League? And what kind of money do you have to play with to see if you can repeat your league win? 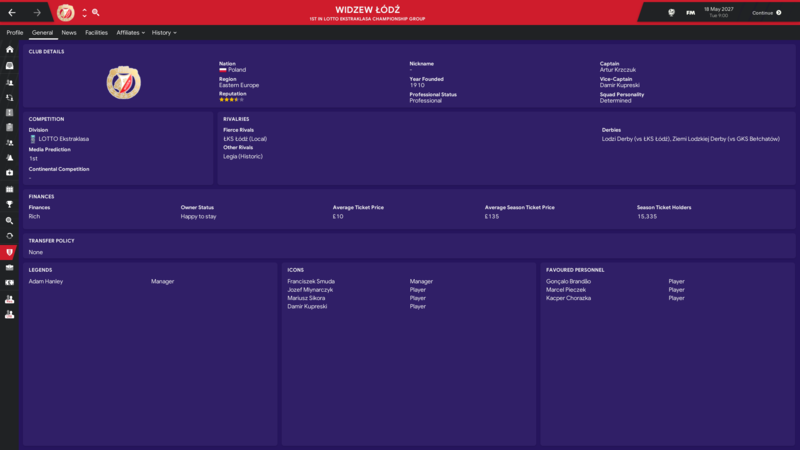 @Biscotti - looks like you've got the Polish league well in hand - will you be playing weakened teams in the league next season to keep everyone fresh and concentrate on the Champions League? Are you concerned that you might have big clubs from bigger leagues circling for your best players after how well you've been performing? A really good first season in the top flight as we finished in the middle of the pack, 6th in the 10 team Swiss Super League. It only took us four or five games to really get our legs under us, after which we never really looked like even flirting with relegation. 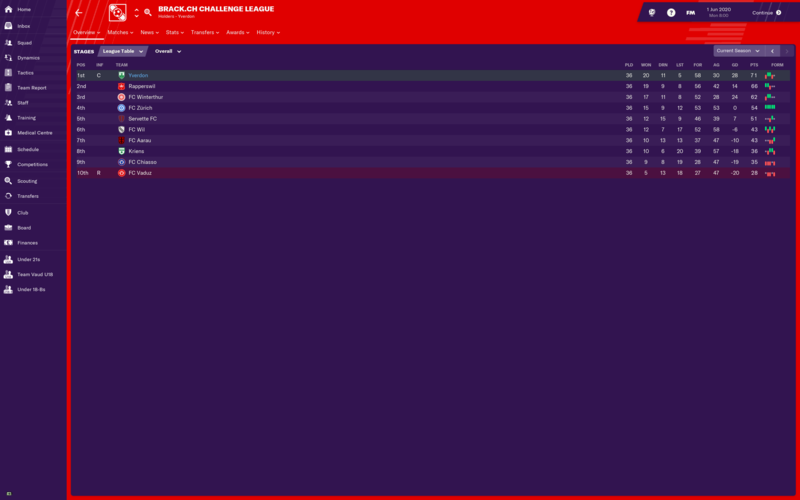 In fact, we spent a good chunk of the middle part of the season looking like we might be able to secure European qualification via the league as we held 4th place for a considerable period of time, but our form fell off towards the end and we ended up in 6th place on goal difference. Still, closer to the top of the league in terms of points than the one automatic relegation spot, and a very nice £1.8m in prize money in our bank account gives us a very nice platform to build on. Quite the surprise outcome here, though it has to be said that we managed to avoid most of the top teams all the way to the final. Entering in the first round, we took on lower league side Vevey, who actually gave us a bit of a run for our money before finally falling to a 3-2 defeat. In the 2nd Round we faced Rapperswil, our old rivals from last season in the Challenge League, who we comfortably dispatched 2-0 to reach the 3rd Round. 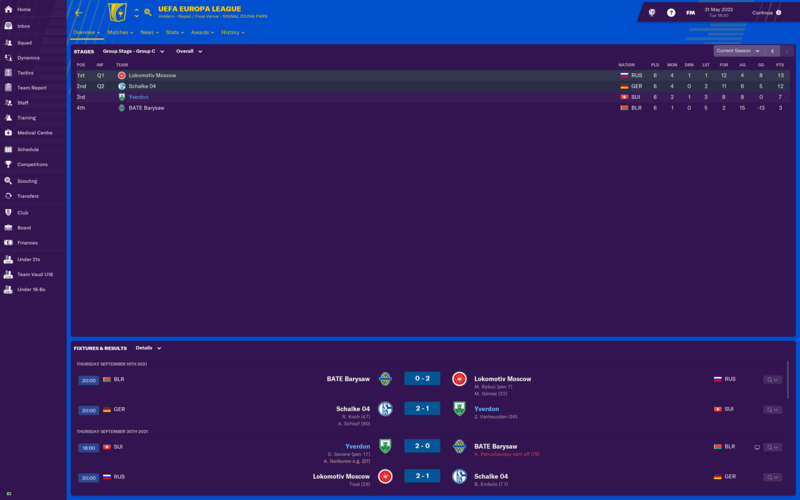 There we would face Lausanne-Sport, a fellow Super League relegation contender, and while the 3-1 win flattered us it was enough to take us through to the Quarter Finals. In our hardest game yet we faced mid-table side FC Sankt Gallen, managed by one Frank De Boer. We surrendered most of the possession but were very dangerous on the counter attack, but with more than 80 minutes gone it was still all square between the two sides. But we finally broke the deadlock in the 84th minute and then put the exclamation point on the win in the 88th to run out 2-0 winners. The Semi-Finals saw us face FC Thun, struggling so badly in the Super League that by this point they had already been relegated. We were all over them for most of the match but couldn’t make it count until we scored the only goal of the game in the 72nd minute, which saw us through to the final. That Final would be against Grasshopper Zurich, another team with a famous manager in Michael Laudrup, and a side we had struggled against all season - they were in a solid 2nd place and heading for Champions League qualification. Despite being comprehensively outplayed, we managed to grab a 61st minute goal on the break and hold on for our first serious silverware - and Europa League qualification. 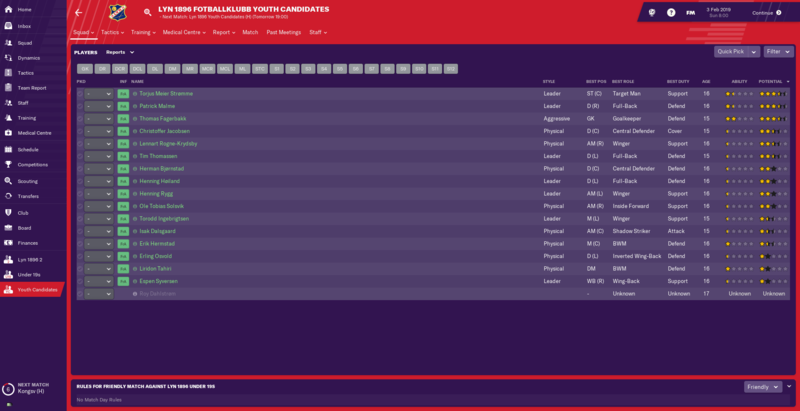 Some serious work was needed to make this team competitive in the Super League, and with attrition to our squad from letting the contracts expire of some of the older players who were at the club when I joined, we found ourselves with only 13 senior players. Not only that, but there seems to be a minimum wage of £700 p/w in the Super League - with a wage budget of just £15k p/w, that meant we could only afford to have 21 players on the books at minimum wage - less than that if we wanted to pay anyone any more than the minimum. The only solution was to get some quality free transfers in and then make up the rest of the squad with loan players where hopefully we could arrange to only pay a small percentage of their salary - or preferably, nothing at all. 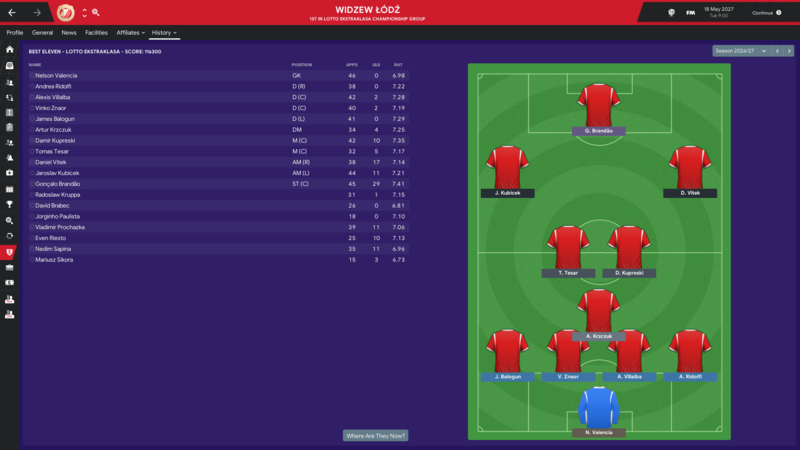 We ended up with a total of 6 loanees in our squad, including three returning from last season in Aboubacar Cisse, Mihailo Stevanovic, and Sadik Vitija. 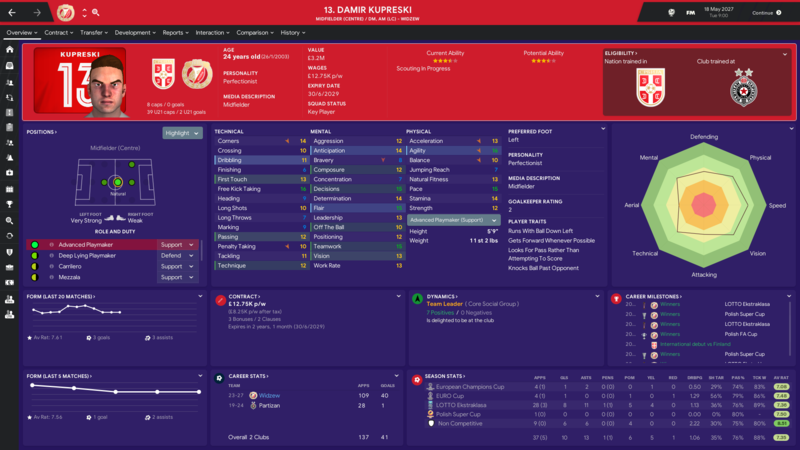 Added to that were Gezim Stucki, an 18 year old Swiss central defender from FC Basel, and the two most exciting loan additions, Zinho Vanheusden, a 21 year old Belgian center back in from Inter Milan, and Alexandro Cavagnera, a defensive midfielder signed on loan from AC Milan. Probably our best signing of the season though was Kwadwo Duah, a Ghanaian winger who I brought in on a free after his contract at the reigning Swiss champions, Young Boys, expired. In the winter transfer window, we found ourselves having to let our promising Czech right back David Kopecky go. With offers on the table from Bayern Munich and Borussia Dortmund and a minimum fee release clause in his contract, we didn’t have much choice. 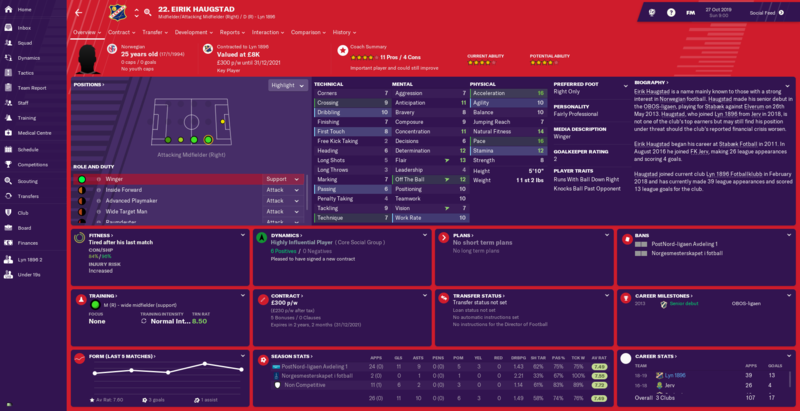 So I squeezed Bayern for everything I could get, including £425k up front, another £300k in installments and future clauses, and a 40% sell on clause, and let him be on his way to Bayern’s reserves. 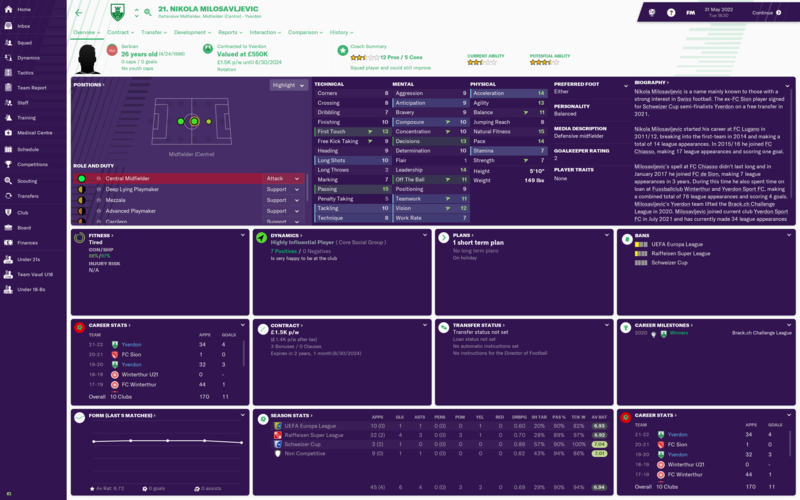 To cover the right back spot I brought in 33 year old Spaniard Diego Seoane, a one time Deportivo La Coruna player who was highly recommended by my scouts, and he did a decent enough job during the second half of the season. The combination of the £1m in top flight TV money, significantly increased gate receipts and season ticket sales, the £2m in prize money we brought in from our league position and our cup win, the £500k+ from the Kopecky transfer, and the extremely tight wage budget, means that we are now in very good financial shape, with £3.6m in the bank and the potential of some Europa League paydays ahead of us. 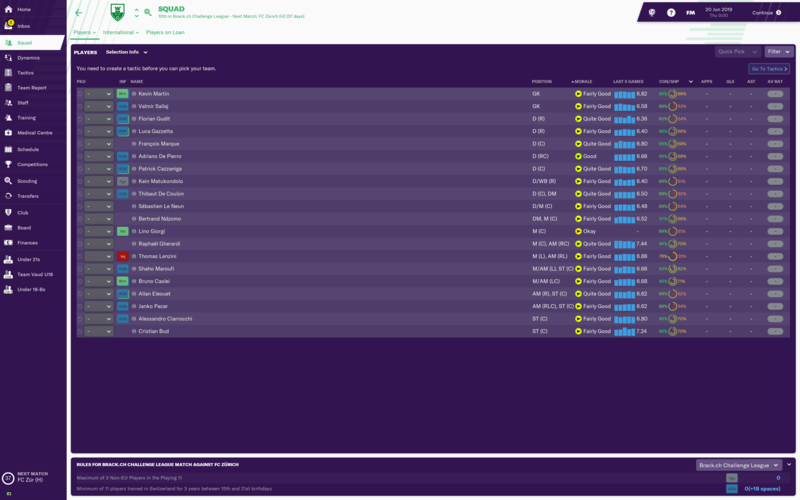 The board has given me a £1.1m transfer budget and £22k p/w wage budget for next season - I’ll probably plough a bit more of that money into wages if I can find some good free players to bring in, but that should be enough to give us a good chance of improving next season. 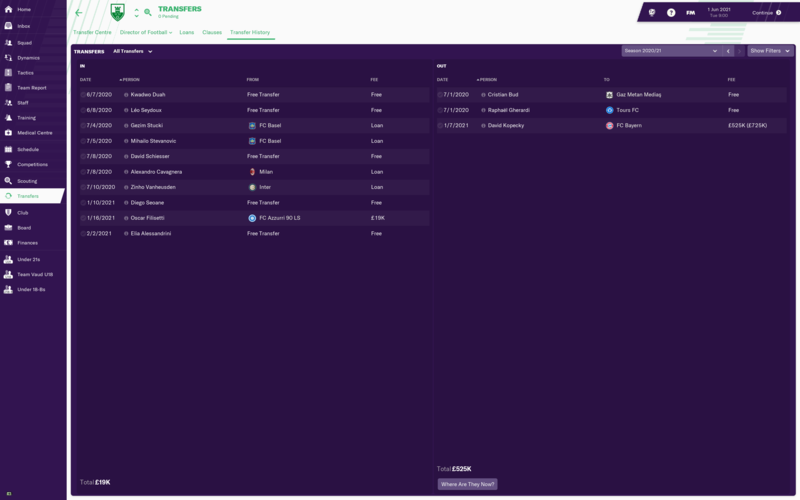 With money in the bank and a Europa League campaign to come, I’m hoping that I can strengthen enough in the summer to mix it up in the top half this season. Being champions is probably still well out of reach - Young Boys finished the season 16 points clear at the top and 29 points ahead of us - but qualifying for European competition through the league is something to aim for. Well, this was extremely unexpected! 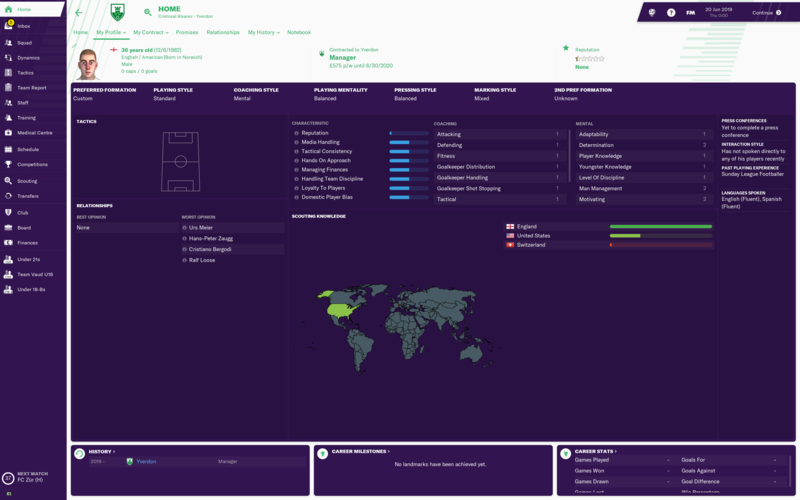 Going to have to take a minute to decide what to do here - reading the rules, it looks like international management is allowed as long as you don't start as an international manager, so I'm in the clear on that front. I'm not sure if I've ever just flat out been offered the England job, so it'll be hard to find it in me to turn it down. Not playing a second-string side, as I still don't have the depth to make me comfortable, but definitely rotating 3-4 players most games. Will do the youngsters good to get the game time. For me, International Management is a bit of a drag and SI need to do some work to make it actually interesting, so I wouldn't take it. If you like International management, though, you should 100% take it. @iseemonsters1 - thanks mate! The team's been overachieving every season so I do keep wondering when the wheels are going to fall off There's about £40million in the bank so I'd imagine I'll see about half of that for transfers. Not a great deal by today's standards but I'm a bit of a bargain hunter and squad building is certainly my strongest attribute when it comes to FM. The squad's not really got any world-beating talent but the players fit the tactical system really well and work nicely as a unit. Champions League - I'm quietly optimistic on the basis of our UEFA Cup campaign - we tanked the likes of Sporting Lisbon away from home and held our own for sure. The level is a lot higher in the Champions League but who knows - I think getting out of the group is possible, but things get a lot harder after that... Congrats on the international job, huge! Good luck for the rest of your challenge. @Biscotti - good to see you becoming a domestic force - Europe next! Hopefully you'll get some strong homegrown talent coming through and can build up the bank account with European revenue. How are your youth facilities? After much deliberation I chose not to take the England offer. 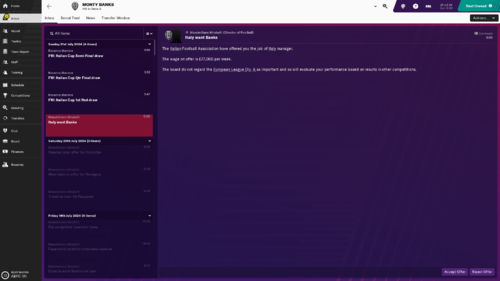 While it was pretty tough to say no, I decided against it for two main reasons: firstly, the idea that someone in my position would be offered the job was unlikely enough that I found that it broke the immersion a little bit, and secondly I felt like it would take the focus away from my club side - when, after all, the point of the challenge is to build up a club side and take them to glory. If I was playing just a regular career game I would definitely have taken it, but it just didn't quite feel right for me for this challenge. After I turned it down, they appointed... Avram Grant. We've had a comfortable bank balance for a few years now, but Poland really doesn't have the appeal to splurge on players. 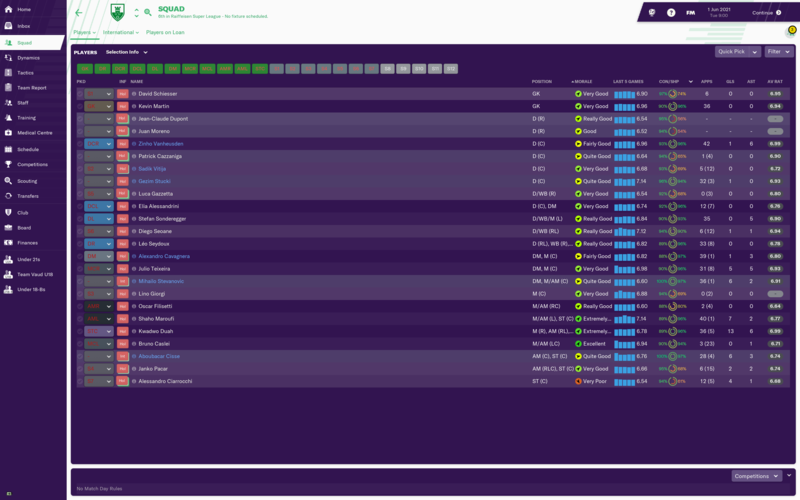 My philosophy has always been to look to youth, though, so I have a very young squad with an average age of just 22. A couple of potential gems in you the youth squads at the moment, but they still need time to develop. Best season yet! We successfully defended our Serie A title and also lifted the Coppa Italia for the first time, completing the domestic double. We lost the Super Cup to Inter after extra time. The team was very competitive in the Champions League, eventually finishing top of the qualifying group with wins over PSV, Benfica and Tottenham. We were comprehensively beaten 6-1 on aggregate by Barcelona in the quarter finals after defeating Lyon in the previous knockout round - this shows that there is still a long way to go until we're capable of beating the elite European teams and completing the challenge. However, the overall performance in Europe was extremely promising and brought in a lot of revenue with which to bolster the squad for our next campaign. Serie A proved to be less competitive than last season and we won it comfortably. We were on a 30-match unbeaten run which ended with a 2-0 loss to Palermo, but that was one of only two losses in the league all season. Much of this season's success can be attributed to the incredible Giorgi Arabidze, now valued at a whopping £57 million (not bad for a free transfer! ), who was joint top scorer in the league alongside our ever-dependable captain Luca Valzania (who still hasn't won an international call-up by the way). Wonderkid Alan Costilla has blossomed into a quality winger, providing 21 assists and playing his way into the Argentina national team. After a disappointing debut season Abdou Diakhate has become a first-choice partner for Valzania in the middle of the park, attracting attention from some big clubs along the way. Our defence was extremely solid all season, only conceding 28 goals in the league thanks to great performances from Portuguese starlet Manuel Silva, Dabila, Rondanini (never puts a foot wrong!) and Miangue. This season's lone striker, Federico Bonazzoli, actually did quite well and finished up with an average rating over 7.0 - the first time a striker has done so in this side. Club legend Emanuele Rovini moved to the number 10 position behind the strikers, in order to accommodate Arabidze on the right, and had a solid season in his new role. 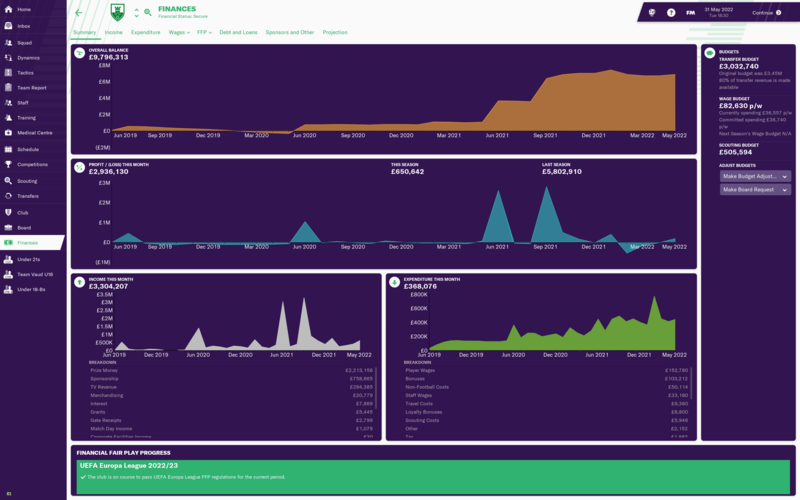 Our finances are still sitting consistently at around £50 million, but again there's not much in the transfer kitty for next season - only around £25 million. Monty Banks has already spent about half of that on securing the transfer of Brazilian wonderkid striker Anderson Luiz through a minimum fee release clause, and fellow Brazilian Dodo will be joining for £11.25 million after being transfer-listed by Man City. There's not much left to add any more new faces to the squad, but to be honest I don't really want to change the team around too much following such a great season. 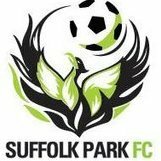 Finally some big news - the team will be moving to a new stadium in the near future, and our youth and training facilities are currently receiving a major upgrade which will hopefully deliver and develop some better youth prospects - there's not many good players coming through the junior ranks at the moment. Onwards and upwards! Starting fresh with the new patch. Going with Czech Republic for this attempt due to the great youth products that they get. @2481 - congratulations on retaining your Serie A title... Europe seems to still be a bit of a jump in the latter stages but i am sure you will get there in the next couple of seasons. And an offer to be Italy manager too - you also have decisions to make! @Balahara - welcome and good luck in the Czech Republic. They certainly do provide some good youth prospects - good luck finding a few! @rlipscombe - cheers mate! Yeah I think once I get more money to spend on transfers it'll be within reach. I've taken the Italy job - I've never managed them and it may motivate me to buy and develop more Italian talent if I've got an opportunity to blood them at international level... 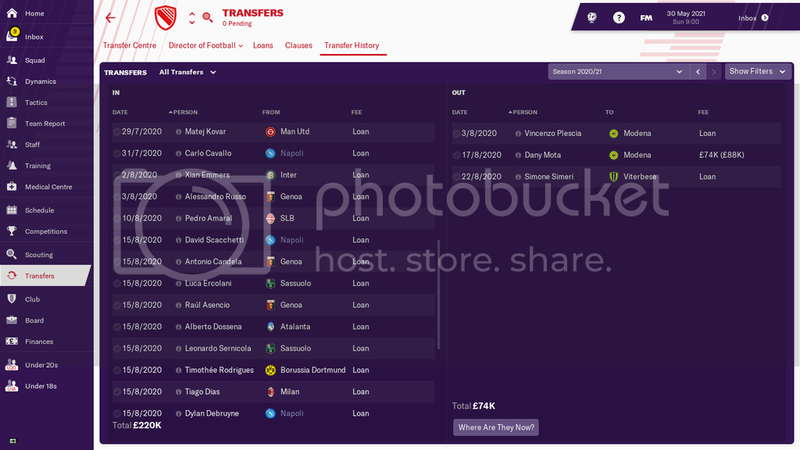 I've found I've been priced out of the market for most of the good young Italian players so far, will have to save up to be able to afford them! Good luck with your league run in and transfer window dealings! In our second season in the top flight we improved in just about every respect, as we were in the running for European contention from the very beginning and secured third place and Europa League qualification with a handful of games to spare. The Swiss league sort of broke down into four tiers this season - Young Boys and FC Basel well clear in the top two, finishing 20 points and 14 points ahead of us respectively. Then we were sort of in a league of our own in 3rd - not anywhere close to the top two but not really threatened by anyone behind us, as we finished 12 points ahead of FC Sion in 4th place. They led the third tier which was a pack of teams very close together from 4th to 8th, and then the final tier were the two relegated clubs, FC Sankt Gallen and FC Lugano. 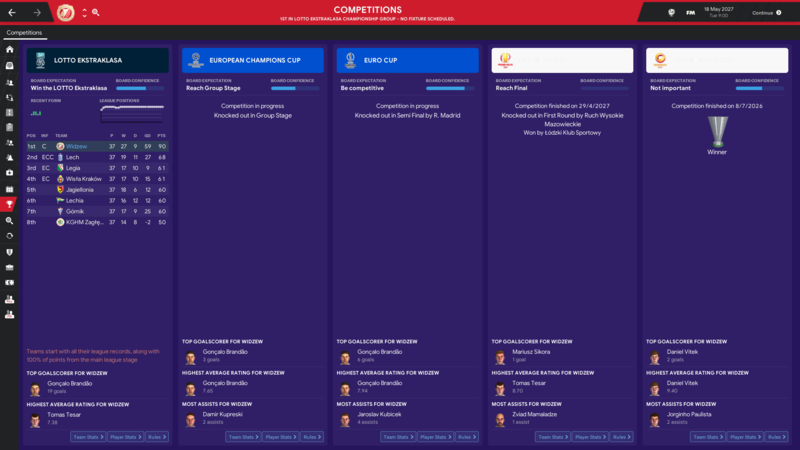 We had another good run in this competition which had me dreaming of retaining the trophy we won last season, as we comfortably dispatched lower league Solothurn in the 1st Round, lower league Fribourg in the 2nd Round, Super League mid-table side Lausanne-Sport in the 3rd Round, and decent 2nd tier side Servette in the Quarter Finals before we faced FC Zurich away in the semi-finals. It was a close match but they managed to pull ahead from a scrambled goal in the 67th minute and it looked like we were facing defeat, until with 90 minutes on the clock winger Kwadwo Duah equalized for us with a near post header form a corner. But then heartbreak as in the 94th minute, a long clearance from their keeper was bungled by the normally reliable Stefan Sonderegger and FC Zurich smashed home a wonder goal from 25 yards to put us out of the competition. 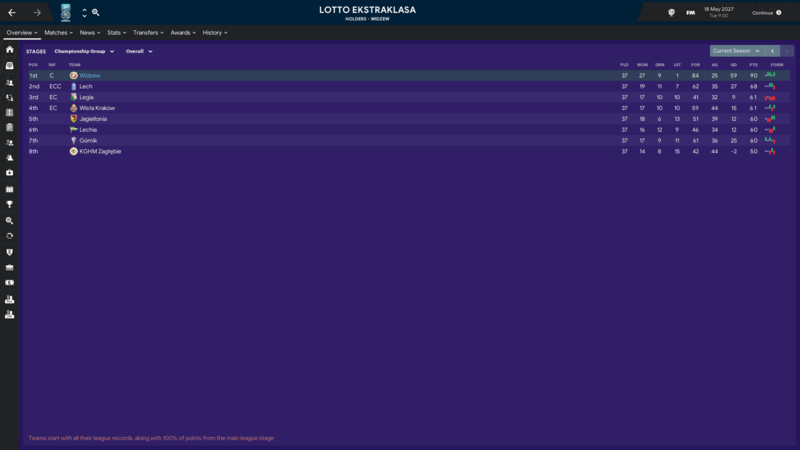 With our Swiss Cup win we faced our first excursion into European competition, starting in the Europa League Best Placed 3rd Qualifying Round where we faced a tough draw against Portuguese side Belenenses. But our first European game was a success as we came away 2-1 winners, which meant a 0-0 draw away was enough to put us through on aggregate. In the 4th Qualifying Round we faced Sparta Prague, who we beat easily at home with a 3-0 win. In the return leg we went down to a close 2-1 defeat but that still meant we reached the Group stage, where we were drawn against Schalke, Lokomotiv Moscow, and BATE Borisov. We gave a good account of ourselves in the group, beating BATE Borisov home and away, getting a 0-0 draw at home against Lokomotiv, and giving Lokomotiv a good game away from home and not getting blown out in losses to Schalke, but two wins and a draw was never going to be enough for us to go through and we ended up 3rd. I won’t complain about that for a first European campaign, and I also won’t complain about the millions that put into our bank account. Our much improved finances meant that we could really make some upgrades to the squad. I shifted most of the £1.2m transfer budget I was given into the wage budget and went bargain hunting. 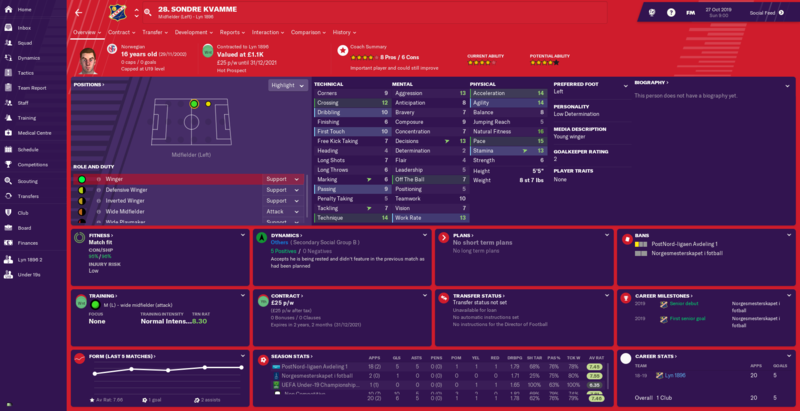 Key pick ups on free transfers were Nikola Milosavljevic, a Serbian midfielder who we’d previously had on loan from FC Sion, Nicolas Hunziker, a Swiss striker in from recently relegated FC Thun, and Joao Oliveira, an excellent Swiss left winger who had been released on a free by Lausanne-Sport. Adding to the squad quality was returning Belgian defender Zinho Vanheusden, on loan again from Inter Milan, and Mihailo Stevanovic, in for a third season long loan from FC Basel. 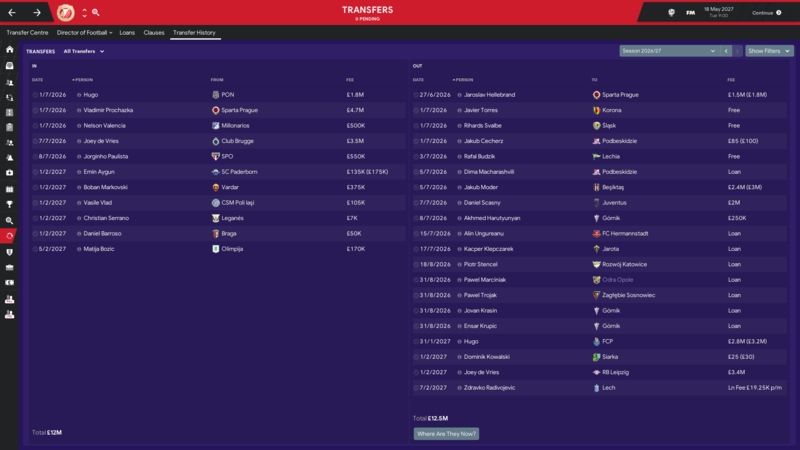 As our finances improved, I cast a wider net with our scouting and splashed out (relatively) with a £270k outlay in the winter transfer window for some very promising youngsters to build around for the future. Coming in were striker Bassirou Kone, already a Mali international at 18, Bosnian U-21 international forward Admir Hajradinovic, and ball playing Swiss U-19 defender Alain Casanova from Grasshopper Zurich. 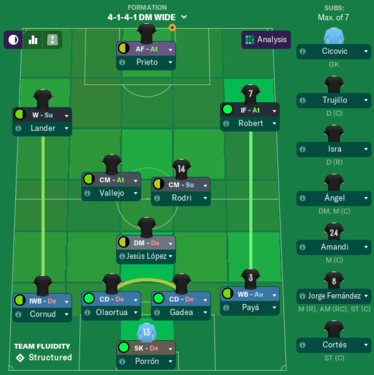 With some solid more experienced players like captain Stefan Sonderegger, one of my first signings at the club and still a reliable presence at left back, and right winger Kwadwo Duah, in his second full season after joining from Young Boys, and with plenty of money in the bank, I’m hopeful that this can be the core we turn into a title contender over the next season or two. 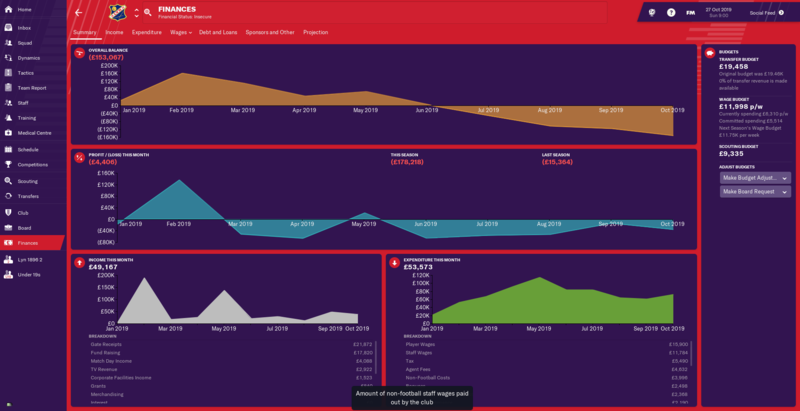 Our successful season on the pitch has put us in very stable shape off the pitch, as we made a total profit of £5.8m this season, bolstered mainly by £4.2m in Europa League prize money and another £2.1m in Swiss Super League prize money. That puts us in a position to start this next season with £9.7m in the bank and another Europa League campaign in the offing. 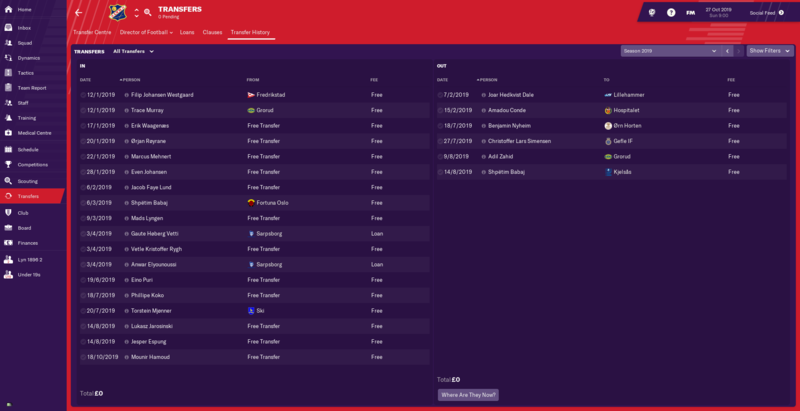 With a £3m transfer budget and an £82k p/w wage budget (we’re currently spending £36k p/w) I think I might be in a position of actually not being able to spend all the money at my disposal. With the right additions in the off season I think this could be the year where we start to close the gap with Young Boys and maybe grab one of the two Champions League places. A lot depends on us developing our young promising players properly while keeping our best older players at the club.